In 1972, beginning in New Orleans, I lived in an ashram for 16 years, was the director of the Long Beach, CA ashram; was on the KRI Board of Directors in the early years; have taught Kundalini Yoga Classes consistently since 1972 and now caretake InnerWorks Wellness Center, home to Kundalini Yoga in Southern CA since 1988. 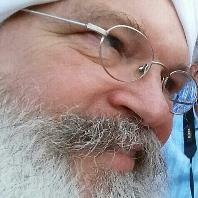 Following the direction of my teacher, Yogi Bhajan, I obtained a PhD in Clinical Psychology and have been a practicing somatic-relational psychotherapist since the late 1970's. As a trainer of teachers my goal is to provide a safe, supportive, challenging environment, rich in opportunity, that optimizes personal growth and provides ample opportunity to practice teaching. It has been my challenge and my joy to embody this sacred science; to free the deep patterns of body/mind/behavior/relationship. I am humbled by and grateful for this mission.